I am proud to say that I have logged in over 10,000 steps a day over the last 7 days. Included in those 10,000+ steps were 3 days of a non-stop one-mile run. Yep, I met my goal of running 1-mile non-stop by February 1st. I am crazy over the fitbit! It motivates me. That little device I hook onto the waist of my pants has a magical quality about it. I find that I will push myself to get in those 10,000 steps. As I mentioned in a previous post about my 90-day weight loss challenge, I registered for the Knoxville Color Me Rad 5k. I’m basically going from couch to 5k. My goal was to be able to run one mile straight by February 1. I only had the chance to run on the treadmill three times last week. I did 3 miles of which one mile I ran each day. This week, my goal is to run that one mile in less time. I did it in 15 minutes, my goal is 12-minutes. I’m not sure if that’s a feasible goal. They’re not used to all this walking and running. They’re begging me to give them a break. Don’t get me wrong, I am listening to my body… but I think I can do this. I am going to throw in a free day once a week, now, though. I do need to give my body a day of rest. So quit your complaining, legs. I do my weigh-ins on Monday mornings, so not sure how I stand this week, but last Monday I was down .5 pounds. I am finding it tougher to lose now that I added exercise, and I know I need to not be so obsessed with the number on the scales… but it is a hard habit to break. I also know that because I’m sore, my muscles are retaining more water. It psychological, but I need to see the scales go down. Average 15,000 steps a day. Increase the time of my one mile run. Be more diligent in my calorie counting. What are your fitness goals for the week? 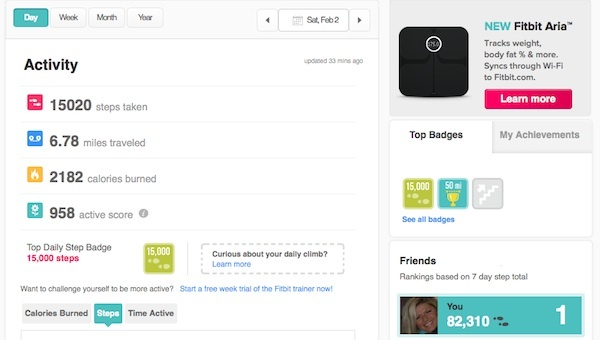 I LOVE the Fitbit, and Congrats on the accomplishment. It’s my most favorite gadget, right now. 🙂 Thank you! So awesome – keep it up! WOOT! You go Donna! I’m going to be watching my carbs this week and getting in my 10K every day too! Thank you, Kelly! I think getting 10,000 steps is a great accomplishment, and so good for our heart! You’re doing amazing and congrats on making it through a mile non-stop. You’re doing great! I need to get a fitbit. 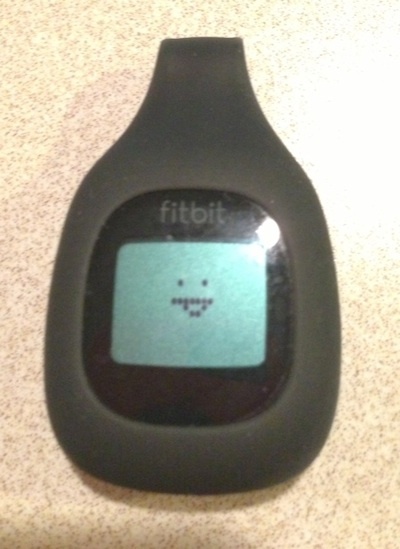 I love using my fitbit, it is so motivating! Congrats! I just started using a fitbit & it’s definitely been motivating me too. … quickly for me! The weight loss you have is amazing as well! Congratulations! I have not yet done my 10,000 steps daily yet. I’m up to 4 to 5 times a week. I started this lifestyle change about 6 months ago. I’m down a mere 23 pounds. My thighs, muscles hurts the most the day after but I still go forward. It’s been years since I last wore shorts and skirts. I feel comfortable to do so now. Keep at it!